2036, Hubcap used, 15", 80-84, CADILLAC, DEVILLE, CHROME OUTER RING, CHARCOAL POCKETS, 60 SLOT TYPE. MACHINED CENTER WITH RAISED COLORED LOGO, METAL CLIPS. 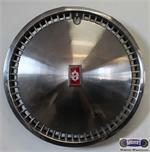 4072, 15" USED HUBCAP, 1980, OLDS, EIGHTY EIGHT, NINETY EIGHT, CUSTOM CRUISER, CHROME OUTER RING, MACHINED FACE, 60-SLOT, BLACK STAMPED EMBLEM. 4074, Hubcap used, 15", 80-90, OLDS, CUSTOM CRUISER, 88, 98, CHROME OUTER RING, MACHINED, 60 SLOT TYPE, BOLT ON EMBLEM, CREST LOGO, METAL CLIPS.